We are almost at the end of our vacation in Chennai and it is time for me to start making my yearly quota of sambar powder,rasam powder, idli chili powder etc etc. Though we can do all them in mixie in small quantities I prefer them to be ground in maavu machine shop as the texture is perfect when we grind with them. I generally prefer my mother’s combination for this powder which is used for cooking at my home for ages. However this version is slightly modified for long term storage. Since we needed this for long term storage we dry roasted all the ingredients rather than drying them under the sun. Drying under the sun is suitable only for shorter duration as small insects would start to form beyond a stage. One of the main ingredients in this recipe is virali manjal which gives good color. Though there are variety of turmeric available in the market I would suggest to use only this turmeric. You may dry roast the curry leaves similar to the way suggested for moringa leaves (Murunga keerai) Tea. 1. Take a heavy bottom vessel and start dry roasting the individual ingredients starting with any order. We started with coriander seeds. Since the quantity is huge we roasted the seeds in batches. Once roasted transfer it to a bigger plate. 2. Dry roast tuar dhal and transfer it to the same plate where coriander seeds where transferred. 3. Dry roast Bengal gram dhal and transfer. Mix all the ingredients in the plate once you transfer and follow the same process for the rest of ingredients. 5. Dry roast cumin seeds. 6. Dry roast methi seeds. 7. Dry roast dry red chili. 9. Lastly the curry leaves. We are already using the dried curry leaves here hence we can switch off the gas and put them for 2 mins to just get it more crisper. If you haven’t dry roasted curry leaves you need to keep it for longer time. It is better to dry the curry leaves under the sun or microwave with the similar approach like the moringa leaves tea. Link here. 10. Mix all the ingredients in the plate and let it cool completely. 11. Transfer it to a container and grind them in a machine mill shop. Refer to my notes for the instructions in machine shop grinding. 12. Once the mixture is grounded and brought home, the mixture must be kept open until cool down. Ideally we spread them in a news paper and cool them. Since I do not want to put it in a newspaper due to its chemical contents I just left the container open and mixed them at times. 13. Close them in airtight container once cooled down. The shelf life for this is around 1+ year as we are dry roasting the ingredients. Dry roasting is necessary if you are making the powder for longer shelf life. If you are making it for 2 – 4weeks time, drying them under the sun is fine. The vessel should be heavy bottom. 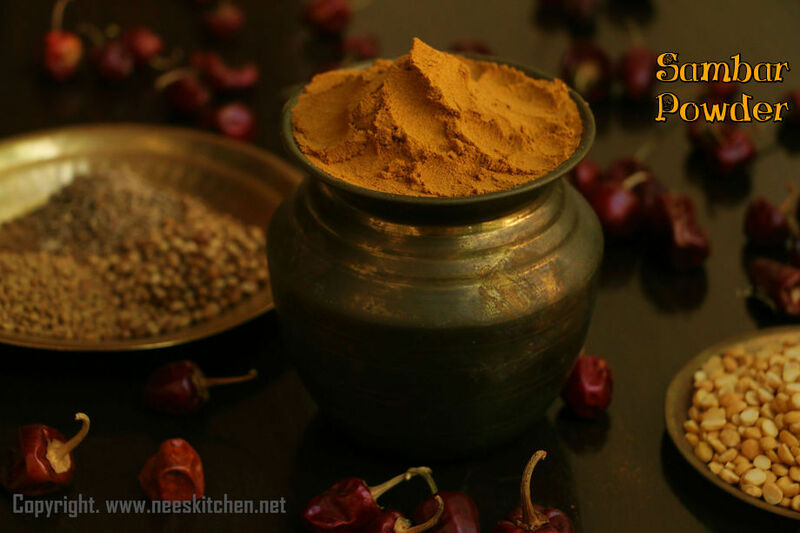 Virali manjal gives good color, hence do not add any other turmeric varieties to this. Smaller quantities can be done in mixie. Make sure this is grounded only in the machine in which chilli based powders are grounded. There are machines for various powders. Sometimes the machine would have ground saunf based powders before your turn. Make sure the machine is cleaned without saunf. Ask for what was grounded before your powder. 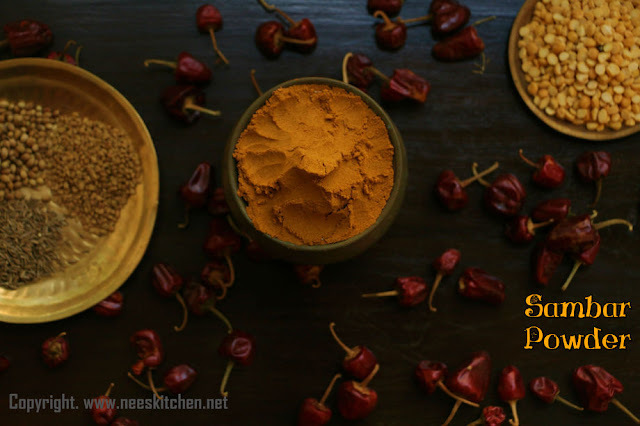 When grinding in the machine, the sambar powder must be ground for 3 times. The weight of the final ground mixture will be lesser than the total weight of raw ingredients.